The location of the Polish–Lithuanian Commonwealth at its maximum extent in 1619. The Polish–Lithuanian Commonwealth, or Republic of Both Nations, formally the Kingdom of Poland and the Grand Duchy of Lithuania, after 1791 the Commonwealth of Poland, was a dualistic state, a bi-confederation, of Poland and Lithuania ruled by a common monarch, who was both the king of Poland and the grand duke of Lithuania. It was one of the largest and most populous countries of 16th- and 17th-century Europe. At its peak in the early 17th century, the Commonwealth spanned some 450,000 square miles (1,200,000 km2) and sustained a multi-ethnic population of 11 million. The union was formalized by the Union of Lublin in July 1569, but the Crown of the Kingdom of Poland and the Grand Duchy of Lithuania were in a de-facto personal union since 1386 with the marriage of the Polish queen Jadwiga of Poland and Lithuania's Grand Duke Jogaila, who was crowned King jure uxoris Władysław II Jagiełło of Poland. The First Partition of Poland in 1772 and the Second Partition of Poland in 1793 greatly reduced the nation's size and the Commonwealth disappeared as an independent state following the Third Partition of Poland in 1795. The Union possessed many features unique among contemporary states. Its political system was characterized by strict checks upon monarchical power. These checks were enacted by a legislature (sejm) controlled by the nobility (szlachta). This idiosyncratic system was a precursor to modern concepts of democracy, constitutional monarchy, and federation. The two component states of the Commonwealth were formally equal, yet Poland was the dominant partner in the union. The Polish–Lithuanian Commonwealth was marked by high levels of ethnic diversity and by relative religious tolerance, guaranteed by the Warsaw Confederation Act 1573; however, the degree of religious freedom varied over time. After several decades of prosperity, it entered a period of protracted political, military and economic decline. Its growing weakness led to its partitioning among its neighbors, Austria, Prussia and the Russian Empire, during the late 18th century. Shortly before its demise, the Commonwealth adopted a massive reform effort and enacted the Constitution of May 3, 1791—the first codified constitution in modern European history and the second in modern world history (after the United States Constitution). The official name of the state was The Kingdom of Poland and the Grand Duchy of Lithuania (Polish: Królestwo Polskie i Wielkie Księstwo Litewskie, Lithuanian: Lenkijos Karalystė ir Lietuvos Didžioji Kunigaikštystė, Ukrainian: Королівство Польське та Вели́ке князі́вство Лито́вське Korolivstvo Polśke ta Vełyke Kniazivstvo Łytovśke, Belarusian: Каралеўства Польскае і Вялікае Княства Літоўскае Karalieŭstva Polskaje i Vialikaje Kniastva Litoŭskaje). Prior to the 17th century, international treaties and diplomatic texts referred to it by its Latin name Regnum Poloniae Magnusque Ducatus Lithuaniae. In the 17th century and later it was usually known as the Most Serene Commonwealth of Poland (Polish: Najjaśniejsza Rzeczpospolita Polska, Latin: Serenissima Res Publica Poloniae), the Commonwealth of the Polish Kingdom, or the Commonwealth of Poland. The country was also known as the Kingdom of Poland, or just Poland. Its inhabitants referred to it in everyday speech as the "Rzeczpospolita" (Ruthenian: Рѣч Посполита Rech Pospolita, Lithuanian: Žečpospolita). Western Europeans often simply called it Poland. The terms: the Commonwealth of Poland and the Commonwealth of Two Nations (Polish: Rzeczpospolita Obojga Narodów, Latin: Res Publica Utriusque Nationis) were used in the Reciprocal Guarantee of Two Nations. In historiography referred to also as the Republic of Nobles (Polish: Rzeczpospolita szlachecka) and the First Commonwealth (Polish: I Rzeczpospolita). Poland and Lithuania underwent an alternating series of wars and alliances during the 14th century and early 15th century. Several agreements between the two (the Union of Kraków and Vilna, the Union of Krewo, the Union of Vilnius and Radom, the Union of Grodno, and the Union of Horodło) were struck before the permanent 1569 Union of Lublin. 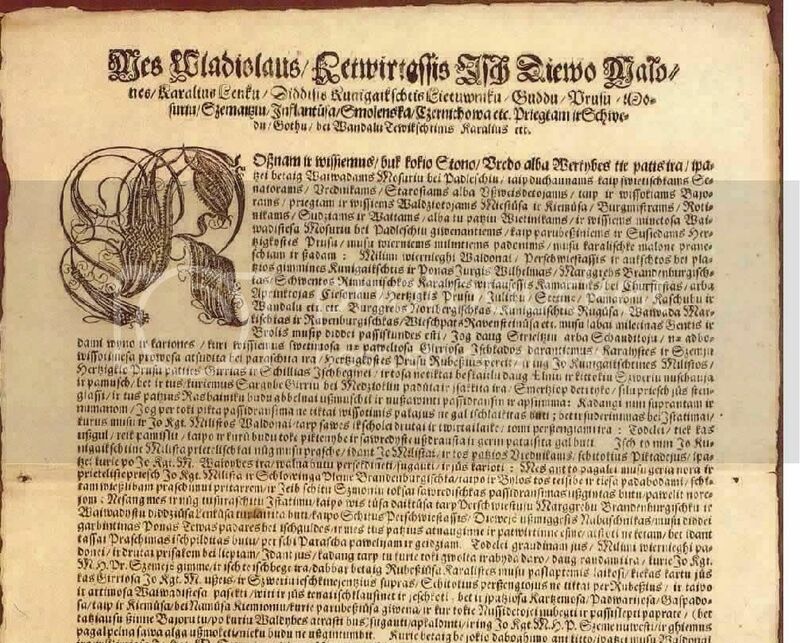 This agreement was one of the signal achievements of Sigismund II Augustus, last monarch of the Jagiellon dynasty. Sigismund believed he could preserve his dynasty by adopting elective monarchy. His death in 1572 was followed by a three-year interregnum during which adjustments were made to the constitutional system; these adjustments significantly increased the power of the Polish nobility and established a truly elective monarchy. The Commonwealth reached its Golden Age in the early 17th century. Its powerful parliament was dominated by nobles (Pic. 2) who were reluctant to get involved in the Thirty Years' War; this neutrality spared the country from the ravages of a political-religious conflict which devastated most of contemporary Europe. The Commonwealth was able to hold its own against Sweden, the Tsardom of Russia, and vassals of the Ottoman Empire, and even launched successful expansionist offensives against its neighbors. In several invasions during the Time of Troubles, Commonwealth troops entered Russia and managed to take Moscow and hold it from September 27, 1610, to November 4, 1612, until they were driven out after a siege. Commonwealth power began waning after a series of blows during the following decades. A major rebellion of Ukrainian Cossacks in the southeastern portion of the Commonwealth (the Khmelnytskyi Uprising in modern-day Ukraine) began in 1648. It resulted in a Ukrainian request, under the terms of the Treaty of Pereyaslav, for protection by the Russian Tsar. Russian annexation of part of Ukraine gradually supplanted Polish influence. The other blow to the Commonwealth was a Swedish invasion in 1655, known as the The Deluge, which was supported by troops of Transylvanian Duke George II Rákóczi and Frederick William, Elector of Brandenburg. Polish–Lithuanian Commonwealth at its maximum extent, after the Truce of Deulino in 1619, superimposed on a current political map. In the late 17th century, the weakened Commonwealth's King John III Sobieski allied himself with Leopold I to deal crushing defeats to the Ottoman Empire. In 1683, the Battle of Vienna marked the final turning point in the 250-year struggle between the forces of Christian Europe and the Islamic Ottoman Empire. For its centuries-long opposition to Muslim advances, the Commonwealth would gain the name of Antemurale Christianitatis (bulwark of Christianity). During the next 16 years, the Great Turkish War would drive the Turks permanently south of the Danube River, never again to threaten central Europe. By the 18th century, destabilization of its political system brought Poland to the brink of civil war. The Commonwealth was facing many internal problems and was vulnerable to foreign influences. An outright war between the King and the nobility broke out in 1715, and Tsar Peter the Great's mediation put him in a position to further weaken the state. The Russian army was present at the Silent Sejm of 1717, which limited the size of the armed forces to 24,000 and specified its funding, reaffirmed the destabilizing practice of liberum veto, and banished the king's Saxon army; the Tsar was to serve as guarantor of the agreement. Western Europe's increasing exploitation of resources in the Americas rendered the Commonwealth's supplies less crucial. In 1768, the Polish–Lithuanian Commonwealth became a protectorate of the Russian Empire. Control of Poland was central to Catherine the Great's diplomatic and military strategies. Attempts at reform, such as the Four-Year Sejm's May Constitution came too late. The country was partitioned in three stages by the neighboring Russian Empire, the Kingdom of Prussia, and the Habsburg Monarchy. By 1795, the Polish–Lithuanian Commonwealth had been completely erased from the map of Europe. Poland and Lithuania were not re-established as independent countries until 1918. Union of Lublin of 1569 by Jan Matejko. The political doctrine of the Commonwealth was: our state is a republic under the presidency of the King. Chancellor Jan Zamoyski summed up this doctrine when he said that Rex regnat et non-gubernat ("The King reigns but [lit. 'and'] does not govern"). The Commonwealth had a parliament, the Sejm, as well as a Senat and an elected king (Pic. 1). The king was obliged to respect citizens' rights specified in King Henry's Articles as well as in Pacta conventa, negotiated at the time of his election. The monarch's power was limited, in favor of a sizable noble class. Each new king had to pledge to uphold the Henrician Articles, which were the basis of Poland's political system (and included near-unprecedented guarantees of religious tolerance). Over time, the Henrician Articles were merged with the Pacta Conventa, specific pledges agreed to by the king-elect. From that point onwards, the king was effectively a partner with the noble class and was constantly supervised by a group of senators. The Sejm could veto the king on important matters, including legislation (the adoption of new laws), foreign affairs, declaration of war, and taxation (changes of existing taxes or the levying of new ones). Golden Liberty created a state that was unusual for its time, although somewhat similar political systems existed in the contemporary city-states like the Republic of Venice. Interestingly, both states were styled "Serenissima Respublica" or the "Most Serene Republic". At a time when most European countries were headed toward centralization, absolute monarchy and religious and dynastic warfare, the Commonwealth experimented with decentralization, confederation and federation, democracy and religious tolerance. When presented with periodic opportunities to fill the throne, the szlachta exhibited a preference for foreign candidates who would not found another strong dynasty. This policy often produced monarchs who were either totally ineffective or in constant debilitating conflict with the nobility. Furthermore, aside from notable exceptions such as the able Transylvanian Stefan Batory (1576–86), the kings of foreign origin were inclined to subordinate the interests of the Commonwealth to those of their own country and ruling house. This was especially visible in the policies and actions of the first two elected kings from the Swedish House of Vasa, whose politics brought the Commonwealth into conflict with Sweden, culminating in the war known as The Deluge (1655), one of the events that mark the end of the Commonwealth's Golden Age and the beginning of the Commonwealth's decline. Zebrzydowski Rebellion (1606–07) marked a substantial increase in the power of the Polish magnates, and the transformation of szlachta democracy into magnate oligarchy. The Commonwealth's political system was vulnerable to outside interference, as Sejm deputies bribed by foreign powers might use their liberum veto to block attempted reforms. This sapped the Commonwealth and plunged it into political paralysis and anarchy for over a century, from the mid-17th century to the end of the 18th, while its neighbors stabilized their internal affairs and increased their military might. Adoption of the Constitution of May 3, 1791 by the Four-Year Sejm and Senate. These reforms came too late, however, as the Commonwealth was immediately invaded from all sides by its neighbors which were content to leave the Commonwealth alone as a weak buffer state, but reacted strongly to king Stanisław August Poniatowski's and other reformers' attempts to strengthen the country. Russia feared the revolutionary implications of the May 3rd Constitution's political reforms and the prospect of the Commonwealth regaining its position as a European power. Catherine the Great regarded the May constitution as fatal to her influence and declared the Polish constitution Jacobinical. Grigori Aleksandrovich Potemkin drafted the act for the Targowica Confederation, referring to the constitution as the "contagion of democratic ideas". Meanwhile, Prussia and Austria, also afraid of a strengthened Poland, used it as a pretext for further territorial expansion. Prussian minister Ewald Friedrich von Hertzberg called the constitution "a blow to the Prussian monarchy", fearing that strengthened Poland would once again dominate Prussia. In the end, the May 3 Constitution was never fully implemented, and the Commonwealth entirely ceased to exist only four years after the Constitution's adoption. The economy of the Commonwealth was dominated by feudal agriculture based on the plantation system (serfs). Slavery in Poland was forbidden in the 15th century; in Lithuania, slavery was formally abolished in 1588. They were replaced by the second enserfment. Typically a nobleman's landholding comprised a folwark, a large farm worked by serfs to produce surpluses for internal and external trade. This economic arrangement worked well for the ruling classes in the early era of the Commonwealth, which was one of the most prosperous eras of the grain trade. The economic strength of Commonwealth grain trade waned from the late 17th century on. Trade relationships were disrupted by the wars and the Commonwealth proved unable to improve its transport infrastructure or its agricultural practices. Serfs in the region were increasingly tempted to flee. The Commonwealth's major attempts at countering this problem and improving productivity consisted of increasing serfs' workload and further restricting their freedoms in a process known as export-led serfdom. Urban population of the Commonwealth was low compared to Western Europe. Exact numbers depend on calculation methods. Accordng to one source, the urban population of the Commonwealth was about 20% of the total in the 17th century, compared to approximately 50% in the Netherlands and Italy. (Pic. 7). Another source suggests much lower figures: 4-8% urban population in Poland, 34-39% in the Netherlands and 22-23% in Italy. The Commonwealth's preoccupation with agriculture, coupled with the szlachta's privileged position when compared to the bourgeoisie, resulted in a fairly slow process of urbanization and thus a rather slow development of industries. Coat of arms of Polish–Lithuanian Commonwealth on 15 ducats of Sigismund III from 1617. Portrait of an Italian merchant and banker, Guglielmo Orsetti. His wealth enabled him to make large loans to the Commonwealth. Portrait of a Greek merchant, Constantine Corniaktos who dealt with international trade, especially from the Ottoman Empire. Still, grain was the largest export commodity of the Commonwealth. The owner of a folwark usually signed a contract with merchants of Gdańsk, who controlled 80% of this inland trade, to ship the grain north to that seaport on the Baltic Sea. Many rivers in the Commonwealth were used for shipping purposes: the Vistula, Pilica, Bug, San, Nida, Wieprz, Neman. The rivers had relatively developed infrastructure, with river ports and granaries. Most of the river shipping moved north, southward transport being less profitable, and barges and rafts were often sold off in Gdańsk for lumber. Hrodna become an important site after formation of a customs post at Augustów in 1569, which became a checkpoint for merchants travelling to the Crown lands from the Grand Duchy. Winged Hussars, one of the main types of the cavalry in the Crown of the Kingdom of Poland between the 16th and 18th centuries. Polish military men, 1697–1795. Drawing by Jan Matejko. The military of the Polish–Lithuanian Commonwealth evolved from the merger of the armies of the Kingdom of Poland and the Grand Duchy of Lithuania. The army was commanded by the Hetman. The most unique formation of the army was the heavy cavalry in the form of the Polish winged hussars. The Polish–Lithuanian Commonwealth Navy never played a major role in the military structure, and ceased to exist in the mid-17th century. Several years before the Union of Lublin, the Polish obrona potoczna was reformed, as the Sejm (national parliament of Poland) legislated in 1562–1563 the creation of wojsko kwarciane (named after kwarta, the type of tax levied on the royal lands for the purpose of maintaining this formation). This formation was also paid for by the king, and in the peace time, numbered about 3,500–4,000 men according to Bardach; Brzezinski gives the range of 3,000–5,000. It was composed mostly of the light cavalry units manned by nobility (szlachta) and commanded by hetmans. Often, in wartime, the Sejm would legislate a temporary increase in the size of the wojsko kwarciane. The Commonwealth was an important European center for the development of modern social and political ideas. It was famous for its rare quasi-democratic political system, praised by philosophers such as Erasmus; and, during the Counter-Reformation, was known for near-unparalleled religious tolerance, with peacefully coexisting Catholic, Jewish, Eastern Orthodox, Protestant and Muslim communities. In the 18th century, the French Catholic Rulhiere wrote of 16th century Poland: "This country, which in our day we have seen divided on the pretext of religion, is the first state in Europe that exemplified tolerance. In this state, mosques arose between churches and synagogues.” The Commonwealth gave rise to the famous Christian sect of the Polish Brethren, antecedents of British and American Unitarianism. With its political system, the Commonwealth gave birth to political philosophers such as Andrzej Frycz Modrzewski (1503–1572) (Pic. 9), Wawrzyniec Grzymała Goślicki (1530–1607) and Piotr Skarga (1536–1612). Later, works by Stanisław Staszic (1755–1826) and Hugo Kołłątaj (1750–1812) helped pave the way for the Constitution of May 3, 1791, which Norman Davies calls the first of its kind in Europe. Kraków's Jagiellonian University is one of the oldest universities in the world (established in 1364), together with the Vilnius University (established in 1579) they were the major scholarly and scientific centers in the Commonwealth. The Komisja Edukacji Narodowej, Polish for Commission for National Education, formed in 1773, was the world's first national Ministry of Education. Commonwealth scientists included: Martin Kromer (1512–1589), historian and cartographer; Michał Sędziwój (1566–1636), alchemist and chemist; Jan Brożek (Ioannes Broscius in Latin) (1585–1652), polymath: a mathematician, physician and astronomer; Krzysztof Arciszewski (Crestofle d'Artischau Arciszewski in Portuguese) (1592–1656), engineer, ethnographer, general and admiral of the Dutch West Indies Company army in the war with the Spanish Empire for control of Brazil; Kazimierz Siemienowicz (1600–1651), military engineer, artillery specialist and a founder of rocketry; Johannes Hevelius (1611–1687), astronomer, founder of lunar topography; Michał Boym (1612–1659), orientalist, cartographer, naturalist and diplomat in Ming Dynasty's service (Pic. 11); Adam Adamandy Kochański (1631–1700), mathematician and engineer; Baal Shem Tov (הבעל שם טוב in Hebrew) (1698–1760), considered to be the founder of Hasidic Judaism; Marcin Odlanicki Poczobutt (1728–1810), astronomer and mathematician (Pic. 12); Jan Krzysztof Kluk (1739–1796), naturalist, agronomist and entomologist, John Jonston (1603–1675) scholar and physician, descended from Scottish nobility. In 1628 the Czech teacher, scientist, educator, and writer John Amos Comenius took refuge in the Commonwealth, when the Protestants were persecuted under the Counter Reformation. Coffin portrait of Barbara Domicela Lubomirska née Szczawińska, 1676. Karol Stanisław Radziwiłł, the richest noble of his time. Another characteristic is common usage of black marble. Altars, fonts, portals, balustrades, columns, monuments, tombstones, headstones and whole rooms (e.g. Marble Room at the Royal Castle in Warsaw, St. Casimir Chapel of the Vilnius Cathedral and Vasa Chapel of the Wawel Cathedral) were decorated with black marble. Baroque Leżajsk organ by Stanisław Studziński and Jan Głowiński were accomplished in 1693. Music was a common feature of religious and secular events. To that end many noblemen founded church and school choirs, and employed their own ensembles of musicians. Some, like Stanisław Lubomirski build their own opera houses (in Nowy Wiśnicz). Yet others, like Janusz Skumin Tyszkiewicz and Krzysztof Radziwiłł were known for their sponsorship of arts which manifested itself in their permanently retained orchestras, at their courts in Vilnius. Musical life further flourished during the reign of the Vasas. Both foreign and domestic composers were active in the Commonwealth. King Sigismund III brought in Italian composers and conductors, such as Luca Marenzio, Annibale Stabile, Asprilio Pacelli, Marco Scacchi and Diomedes Cato for the royal orchestra. Notable home grown musicians, who also composed and played for the King's court, included Bartłomiej Pękiel, Jacek Różycki, Adam Jarzębski, Marcin Mielczewski, Stanisław Sylwester Szarzyński, Damian Stachowicz, Mikołaj Zieleński and Grzegorz Gorczycki. Magnates often undertook construction projects as monuments to themselves: churches, cathedrals, monasteries (Pic. 14), and palaces like the present-day Presidential Palace in Warsaw and Pidhirtsi Castle built by Grand Hetman Stanisław Koniecpolski herbu Pobóg. The largest projects involved entire towns, although in time many of them would lapse into obscurity or be totally abandoned. Usually they were named after the sponsoring magnate. Among the most famous is the town of Zamość, founded by Jan Zamoyski and designed by the Italian architect Bernardo Morando. The magnates throughout Poland competed with the kings. The monumental castle Krzyżtopór, built in the style palazzo in fortezza between 1627 and 1644, had several courtyards surrounded by fortifications. Due to efforts of powerful Radziwiłł family, the town of Nesvizh in today's Belarus came to exercise significant influence in many domains – the Nesvizh manufactures of firearm, carpets, kontusz sashes and tapestries as well as school of painting produced renowned and luxury items. Late baroque fascination with the culture and art of the "central nation" is reflected in Queen Marysieńka's Chinese Palace in Zolochiv. 18th century magnate palaces represents the characteristic type of baroque suburban residence built entre cour et jardin (between the entrance court and the garden). Its architecture – a merger of European art with old Commonwealth building traditions are visible in Wilanów Palace in Warsaw (Pic. 15), Branicki Palace in Białystok and in Warsaw, Potocki Palace in Radzyń Podlaski and in Krystynopol, Raczyński Palace in Rogalin and Sapieha Palace in Ruzhany. The First Lady of the Republic, Elżbieta Sieniawska, portrayed in Sarmata pose and in male coat delia. The prevalent ideology of the szlachta became "Sarmatism", named after the Sarmatians, alleged ancestors of the Poles. This belief system was an important part of the szlachta's culture, penetrating all aspects of its life. Sarmatism enshrined equality among szlachta, horseback riding, tradition, provincial rural life, peace and pacifism; championed oriental-inspired attire (żupan, kontusz, sukmana, pas kontuszowy, delia, szabla); and served to integrate the multi-ethnic nobility by creating an almost nationalistic sense of unity and of pride in the szlachta's Golden Freedoms. Further information: Historical demographics of Poland. Population density per voivodeships in the Polish–Lithuanian Commonwealth in 1650. The population of the Commonwealth was never overwhelmingly either Roman Catholic or Polish. This circumstance resulted from Poland's possession of Ukraine and federation with Lithuania, in both of which countries ethnic Poles were a distinct minority. The Commonwealth comprised primarily four nations: Poles, Lithuanians, Belarusians and Ukrainians; the latter two usually referred to as the Ruthenians. Sometimes inhabitants of the Grand Duchy of Lithuania were called Litvins, a Slavic term for people from Lithuania, regardless their ethnicity (with the exception of Jews, which were called Litvaks). Shortly after the Union of Lublin ( 1569 ), the Commonwealth population was around 7 million, with a rough breakdown of 4.5 m Poles, 0.75 m Lithuanians, 0.7 m/10% Jews and 2 m Ruthenians. In 1618, after the Truce of Deulino, the Commonwealth population increased together with its territory, reaching 12 million people, which was composed roughly of 4.5 m Poles, 3.5 m Ukrainians, 1.5 m Belarusians, 0.75 m Lithuanians, 0.75 m Old Prussians, 0.5 m Jews, and 0.5 m Livonians. At that time nobility was 10% of the population, and burghers were 15%. The average population density per square kilometer was: 24 in Mazovia, 23 in Lesser Poland, 19 in Great Poland, 12 in Lublin palatinate, 10 in the Lvov area, 7 in Podolia and Volhynia, 3 in the Ukraine. There was a tendency for the people from the more densely inhabited western territories to migrate eastwards. In the period from 1648–57, populations losses are estimated at 4 m. Coupled with further population and territorial losses, in 1717 the Commonwealth population had fallen to 9 m, with roughly 4.5 m/50% Poles, 1.5 m/17% Ukrainians, 1.2 m Belarusians, 0.8 m Lithuanians, 0.5 m Jews, and 0.5 m others. Just before the first partition of Poland, the Commonwealth's population stood at some 14 million, including around 1 million nobles, 4,7 million Uniates and 400,000 Orthodox Christians. In 1792, the population was around 11 million and included 750,000 nobles. Poland has a long tradition of religious freedom. The right to worship freely was a basic right given to all inhabitants of the Commonwealth throughout the 15th and early 16th century, however, complete freedom of religion was officially recognized in Poland in 1573 during the Warsaw Confederation. Poland kept religious freedom laws during an era when religious persecution was an everyday occurrence in the rest of Europe. Commonwealth was a place were the most radical religious sects, trying to escape persecution in other countries of the Christian world, sought refuge. In 1561 Bonifacio d’Oria, a religious exile living in Poland, wrote of his adopted country's virtues to a colleague back in Italy: “You could live here in accordance with your ideas and preferences, in great, even the greatest freedoms, including writing and publishing. No one is a censor here." "This country became a place of shelter for heretics” – Cardinal Hozjusz papal legate to Poland. To be Polish, in the non-Polish lands of the Commonwealth, was then much less an index of ethnicity than of religion and rank; it was a designation largely reserved for the landed noble class (szlachta), which included Poles but also many members of non-Polish origin who converted to Catholicism in increasing numbers with each following generation. For the non-Polish noble such conversion meant a final step of Polonization that followed the adoption of the Polish language and culture. Poland, as the culturally most advanced part of the Commonwealth, with the royal court, the capital, the largest cities, the second-oldest university in Central Europe (after Prague), and the more liberal and democratic social institutions had proven an irresistible magnet for the non-Polish nobility in the Commonwealth. Many referred to themselves as "gente Ruthenus, natione Polonus" (Ruthenian by blood, Polish by nationality) since 16th century onwards. Greek-Catholic St. George's Cathedral in Lwów was constructed between 1746–1762 following the Act of Unification of the Lwów archeparchy with the Holy See. Church in Kamieniec Podolski was converted into a mosque during the Turkish occupation between 1672–1699, the 33m minaret was added at that time. As a result, in the eastern territories a Polish (or Polonized) aristocracy dominated a peasantry whose great majority was neither Polish nor Roman Catholic. Moreover, the decades of peace brought huge colonization efforts to Ukraine, heightening the tensions among nobles, Jews, Cossacks (traditionally Orthodox), Polish and Ruthenian peasants. The latter, deprived of their native protectors among the Ruthenian nobility, turned for protection to cossacks that facilitated violence that in the end broke the Commonwealth. The tensions were aggravated by conflicts between Eastern Orthodoxy and the Greek Catholic Church following the Union of Brest, overall discrimination of Orthodox religions by dominant Catholicism, and several Cossack uprisings. In the west and north, many cities had sizable German minorities, often belonging to Lutheran or Reformed churches. The Commonwealth had also one of the largest Jewish diasporas in the world – by the mid-16th century 80% of the world's Jews lived in Poland (Pic. 16). Until the Reformation, the szlachta were mostly Catholic or Eastern Orthodox (Pic. 3, 13). However, many families quickly adopted the Reformed religion. After the Counter-Reformation, when the Roman Catholic Church regained power in Poland, the szlachta became almost exclusively Roman Catholic, despite the fact that Roman Catholicism was not a majority religion (the Roman Catholic and Orthodox churches counted approximately 40% of the population each, while the remaining 20% were Jews and members of various Protestant churches). The Crown had about double the population of Lithuania and five times the income of the latter's treasury. As with other countries, the borders, area and population of the Commonwealth varied over time. After the Peace of Jam Zapolski (1582), the Commonwealth had approximately 815,000 km² area and a population of 7.5 million. After the Truce of Deulino (1618), the Commonwealth had an area of some 990,000 km² and a population of 11–12 million (including some 4 million Poles and close to a million Lithuanians). First Anniversary anthem of the Constitution of May 3, 1791 (1792) in Hebrew, Polish, German and French. Ruthenian – also known as Chancellery Slavonic; off. recog. ; official language in the Grand Duchy chancellery until 1697 (when replaced by Polish); used in some foreign relations its dialects were widely used in the Grand Duchy and eastern parts of the Crown as spoken language. Commonwealth borders shifted with wars and treaties, sometimes several times in a decade, especially in the eastern and southern parts. After the Peace of Jam Zapolski (1582), the Commonwealth had approximately 815,000 km² area and a population of 7.5 million. After the Truce of Deulino (1618), the Commonwealth had an area of some 1 million km² (990,000 km²) and a population of about 11 million. Statuta Regni Poloniae in ordinem alphabeti digesta (Statutes of the Polish Kingdom, Arranged in Alphabetical Order), 1563. Grand Marshal of the Crown Łukasz Opaliński portraited with the insignium of his power in the parliament - the Marshal's cane, 1640. Rococo iconostasis in the Orthodox Church of the Holy Spirit in Vilnius, designed by Johann Christoph Glaubitz, 1753–1756. 18th century amber casket. Gdańsk patronized by the Polish court flourished as the center for amber working in the 17th century. Stanisław Poniatowski, Commander of the Royal Guards and Grand Treasurer. Painted by Angelika Kauffmann in 1786. Equestrian portrait of King Sigismund III of Poland, by Peter Paul Rubens, 1624. Tapestry with the Arms of Michał Kazimierz Pac, Jan Leyniers, Brussels, 1667–1669. Silver tankard by Józef Ceypler, Kraków, 1739–1745. Example of the merchant architecture: Konopnica's tenement house in Lublin, 1575. Hussars' armours, first half of the 17th century. De republica emendanda (1554) by Andrzej Frycz Modrzewski, proposed a deep programme of reforms of the state, society and church. Merkuriusz Polski Ordynaryjny, the first Polish newspaper published on the orders of Queen Marie Louise Gonzaga in 1661. Title page of Treny (1580) by Jan Kochanowski, a series of elegies upon the death of his beloved daughter, is an acknowledged masterpiece. A plate from Michał Boym's Flora Sinensis (1656), the first description of an ecosystem of the Far East published in Europe. Taurus Poniatovii, constellation originated by Marcin Poczobutt in 1777 to honor the king Stanisław II Augustus. Branicki Palace in Białystok, designed by Tylman van Gameren, is sometimes referred to as the "Polish Versailles." Pažaislis Monastery in Kaunas, Pietro Puttini, built 1674–1712. Zamość City Hall, designed by Bernardo Morando, is a unique example of Renaissance architecture in Europe, consistently built in accordance with the Italian theories of an "ideal town." Plafond Allegory of Spring, Jerzy Siemiginowski, 1680s, Wilanów Palace. Łańcut Synagogue was established by Stanisław Lubomirski, 1733.
b. ^ Some historians date the change of the Polish capital from Kraków to Warsaw between 1595 and 1611, although Warsaw was not officially designated capital until 1793. The Commonwealth Sejm began meeting in Warsaw soon after the Union of Lublin and its rulers generally maintained their courts there, although coronations continued to take place in Krakow. The modern concept of a single capital city was to some extent inapplicable in the feudal and decentralized Commonwealth. Warsaw is described by some historians as the capital of the entire Commonwealth. Vilnius, the capital of the Grand Duchy, is sometimes called the second capital of the entity. ↑ Name used for the common state, Henryk Rutkowski, Terytorium, w: Encyklopedia historii gospodarczej Polski do 1945 roku, t. II, Warszawa 1981, s. 398. ↑ Richard Buterwick. The Polish Revolution and the Catholic Church, 1788-1792: A Political History. Oxford University Press. 2012. pp. 5, xvii. ↑ The death of Sigismund II Augustus in 1572 was followed by a three-year Interregnum during which adjustments were made in the constitutional system. The lower nobility was now included in the selection process, and the power of the monarch was further circumscribed in favor of the expanded noble class. From that point, the king was effectively a partner with the noble class and constantly supervised by a group of senators. ↑ Frost, Robert I. The Northern Wars: War, State and Society in northeastern Europe, 1558–1721. Harlow, England; New York: Longman's. <templatestyles src="Module:Citation/CS1/styles.css"></templatestyles> 2000. Especially pp9–11, 114, 181, 323. ↑ Brzezinski (1988), p. 6. ↑ 77.0 77.1 77.2 77.3 77.4 77.5 77.6 Bardach et al. (1987), pp. 229–230. ↑ 78.0 78.1 Brzezinski (1987), p. 10. ↑ Bardach et al. (1987), pp. 227–228. ↑ Kazimierz Maliszewski (1990). Obraz świata i Rzeczypospolitej w polskich gazetach rękopiśmiennych z okresu późnego baroku: studium z dziejów kształtowania się i rozpowszechniania sarmackich stereotypów wiedzy i informacji o "theatrum mundi" (in polski). Schr. p. 79. ISBN 83-231-0239-2. <templatestyles src="Module:Citation/CS1/styles.css"></templatestyles> W każdym razie "królowa bez korony i pierwsza dama Rzeczypospolitej", jak współcześni określali Sieniawską, zasługuje na biografię naukową. ↑ 97.0 97.1 Matthew P. Romaniello, Charles Lipp. Contested Spaces of Nobility in Early Modern Europe. Ashgate Publishing, Ltd. 2011. p. 233. ↑ David L. Ransel, Bozena Shallcross. Polish Encounters, Russian Indentity. Indiana University Press. 2005. p. 25. ↑ "Poland, history of", Encyclopædia Britannica from Encyclopædia Britannica Premium Service. . Retrieved February 10, 2006 and "Ukraine", Encyclopædia Britannica from Encyclopædia Britannica Premium Service. . Retrieved February 14, 2006. ↑ Karol Zierhoffer, Zofia Zierhoffer (2000). Nazwy zachodnioeuropejskie w języku polskim a związki Polski z kulturą Europy (in polski). Wydawnictwo Poznańskiego Towarzystwa Przyjaciół Nauk. p. 79. ISBN 83-7063-286-6. <templatestyles src="Module:Citation/CS1/styles.css"></templatestyles> Podobną opinię przekazał nieco późnej, w 1577 r. Marcin Kromer "Za naszej pamięci weszli [...] do głównych miast Polski kupcy i rzemieślnicy włoscy, a język ich jest także częściowo w użyciu, mianowicie wśród wytworniejszych Polaków, którzy chętnie podróżują do Włoch". ↑ Jan K. Ostrowski, ed. (1999). Art in Poland, 1572–1764: land of the winged horsemen. Art Services International. p. 32. ISBN 0-88397-131-3. <templatestyles src="Module:Citation/CS1/styles.css"></templatestyles> In 1600 the son of the chancellor of Poland was learning four languages: Latin, Greek, Turkish, and Polish. By the time he had completed his studies, he was fluent not only in Turkish but also in Tatar and Arabic. This page was last modified on 11 January 2016, at 19:36.